The ONS has today released its latest monthly UK trade statistics. They show that despite growing UK trade and a slight narrowing of the trade deficit, the problems in the eurozone are still hampering UK exports to the rest of the EU. The value of UK exports increased by 3.5% between February 2013 and March 2013. The value of imports increased by 2.6% over the same period. The widening of the deficit with the EU in the first quarter came mainly from trade with Germany and the Netherland. Outside the EU, the UK’s surplus in trade with the US improved by around £1.1 billion in the first quarter, largely due to a recovery in exports. Within EU countries, imports from Belgium & Luxembourg increased by £0.4 billion and imports from Germany increased by £0.1 billion. 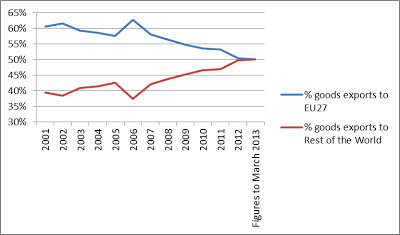 Within EU countries, exports to Germany decreased by £0.3 billion. So in general UK trade is up but exports to the EU are down. The decrease in UK exports to the EU has increased the UK's deficit with the EU as eurozone states have managed to increase their exports to the UK - if not to each other. Firstly, although the EU remains a vital market for UK goods the eurozone crisis has led to a diversification into other markets. 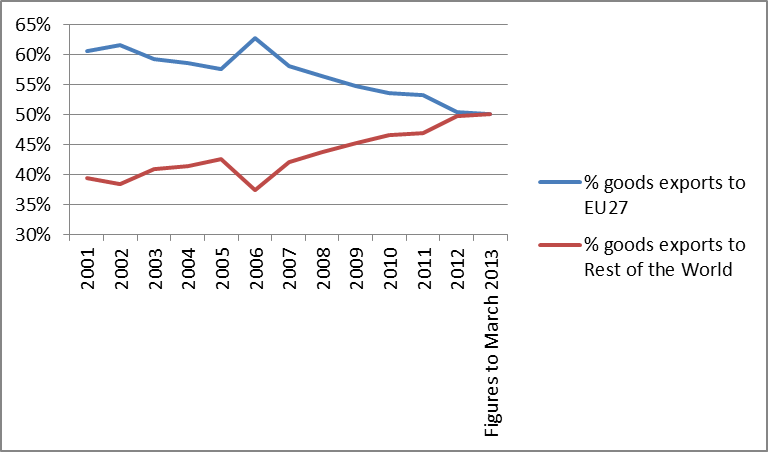 Secondly, the eurozone crisis has let to a widening in the UK's EU trade deficit. This appears to be due to a fall off in eurozone demand for UK exports combined with a continued appetite in the UK for EU goods. However, it is important to note these figures are for goods only. As we set out in our report Trading Places the picture for the UK's services exports differs substantially. The UK has a world class services sector that produce a substantial trade surplus. The best growth markets for this sector is undoubtedly in the growth markets outside the EU. For UK services, as long as the EU remains a fragmented market the relative merits of doing business in the EU over other global markets are small. All the more reason to push on with EU Services liberalisation as we propose here.